With winter closing in and the light disappearing ever earlier, it’s time to get yourself set up so you can keep working into the evening. With a fantastic new range of site-lights to illuminate your way, you can be sure of working safely and efficiently until your regular summer knock-off time; giving you the competitive edge and the element of safety many others can’t promise. 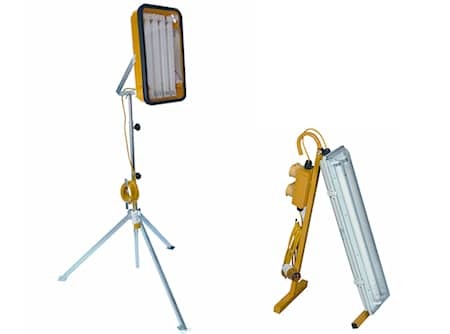 From fluorescent tripods to splitter boxes and easy-to-carry A frames you can make use of the 3- or 4-metre cable to easily access the job you’re working on. The fluorescent tubes shed light on those tiny details that you would otherwise have to leave until the next morning. Any building site that lacks adequate onsite lighting at this time of year is putting the workers in danger, and, as a result, could well put the build in jeopardy. With workers able to see what they’re doing, they’ll avoid injury on hazards that, with a little light on the subject, would be avoided. Built with polycarbonate and coated steel, the lighting is sturdy enough to guarantee its longevity, without being unwieldy heavy.